‘War and Peace’ is one of the finest books on war ever written. Author, Leo Tolstoy paints a vivid battleground picture with his words. We’re not sure if anyone in Star Sports Pro Kabaddi has read this book, but taking into account the number of beast-mode players in the league, we wouldn’t bet against a couple of them having read a page or two and taken inspiration from the same. It’s only appropriate that we start off with a player from the Bengal Warriors. The veteran defender will celebrate his 36th birthday in October. Instantly recognizable in his team’s right corner, Nilesh isn’t one to shy away from a hard hitting tackle. His head first tackle against Delhi Dabang’s Rohit Kumar resulted in him suffering a spinal injury. Fortunately, he has recovered from that clash. Nilesh comes across as a man who would gladly dive on a land mine to protect his men. While Anup and company carry out raid after raid, defender Mohit is generally the one doing the dirty work for his team. The 20-year-old is never afraid of a challenge and more often than not, comes out on top. No wonder he already has 22 successful tackles to his name this season. His aggressive yet creative approach towards the game has caught the eye of pundits and fans alike. The fourth most successful raider this season, Jasvir plays the game at his own pace. His nonchalant approaches during raids are deceptive to say the least. While he may not be the biggest player in this list, expect the thirty one year old to dig out his team from any situation. For him, winning is not a choice, it is mandatory. Jasvir is a true commander on the mat. 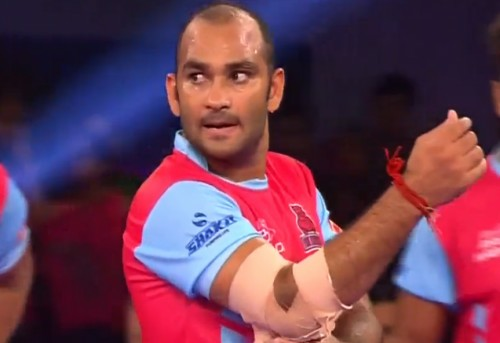 The 31-year-old has the responsibility of guiding the Jaipur Pink Panthers to another semi final spot this season. The team currently languishes in sixth position. Whether it’s for his country or club, the 18-year-old defender will put his body on the line for his team come what may. He seems to have formed a formidable partnership with star raider, Rahul Chaudhari and protects him from opposition raiders, who try and target Rahul when the Titans have to defend. His rampaging tackles are a treat to watch. At war, he would, no doubt, be the first to take a bullet for his fellow soldiers. The list cannot be complete without the inclusion of the nimble footed all-rounder. He looks like a player who could instill the confidence of a Lion, in even the most nervous players. The 22-year-old has speed to burn for and will be a vital asset at war. His intensity and energy has won him numerous plaudits. But would anyone really want to get into an argument with the extremely fit and versatile player from Patna Pirates?